Occurrence: Rye is specifically used in rye bread and crisp breads. Rye can substitute for wheat in many foods. More information.. Adverse reactions to wheat have been more frequently reported than to other cereal-based foods. The best defined of these are coeliac disease and IgE-dependent wheat allergy, both of which result from malfunctioning of the immune system. Allergies to other cereals such as maize, sorghum and millet, are not common and are not related to reactions triggered by wheat, rye, barley and oats. As a consequence individuals with wheat allergy, including coeliac disease, can usually eat maize-based foods such as polenta. However, allergic reactions to maize can result from the fruit allergies found in the South of Europe which often start with reactions to peach. Coeliac disease is triggered by the gluten fraction of wheat or by the gluten-like proteins found in other closely related cereals such as rye, barley. Some sensitive individuals may also react to oats. The gut reacts to the gluten and becomes smooth, loosing its ability to absorb nutrients; symptoms including diarrhoea as well as deficiencies in nutrients like vitamins. It can manifest itself in childhood, affecting children’s growth and development, or in adult hood. As there is no cure individuals with coeliac disease have to avoid eating gluten for life. However, coeliac disease does not cause the potentially fatal reaction of anaphylaxis if gluten is accidentally eaten. In contrast IgE-mediated cereal allergies can be caused by the antibody molecule IgE binding to many proteins, not just gluten. Sometimes the reactions (often severe) only develop if an individual takes exercise within a few hours of eating wheat or related cereals, in a condition called exercise-induced anaphylaxis. Individuals with wheat allergy often react to closely related cereals like barley and rye, less frequently to the more distant relative, oats. Diagnosis of cereal allergies can be complicated by the fact that some of the blood tests for cereal food allergy can accidentally detect allergy to grass pollens instead. As a consequence of these adverse reactions, cereals containing gluten, (i.e. wheat, rye, barley, oats, spelt or their hybridized strains) have been included in Annex IIIa of the food labelling directive along with derived products. Temporary exceptions to the labelling rule (derogations) have been granted for wheat based glucose syrups including dextrose, wheat based maltodextrins, glucose syrups based on barley and cereals used in distillates for spirits. Järvinen et al 2003  reported on 90 paediatric milk allergic patients who had residual symptoms after elimination of milk. 6 were challenged with rye (open) and 1 showed immediate symptoms (urticaria) while 5 showed delayed symptoms (2 eczematous rash, 2 diarrhoea, 1 eczematous rash and diarrhoea). Of a group of patients with wheat-dependent exercise induced anaphylaxis (Palosuo et al. 2001 ), 2 reported exercise induced symptoms with rye. 35 adult patients were studied with severe chronic atopic dermatitis, 4 with urticaria and 1 with rhinitis. (Varjonen et al. 1994 ). Palosuo et al. (2001)  used purified gamma-70 secalin and gamma-35 secalin (500 µg/mL in 20% v/v ethanol-phoshate buffered saline). Negative control was saline and 20% (v/v) ethanol-phoshate buffered saline. Positive control was 10mg/ml histamine hydrochloride. Wheal was taken as positive if diameter half positive control(Palosuo et al. 2001 ). A positive SPT response was defined as a wheal 3 mm larger than the negative (saline solution) control (Jones et al. 1995 ). Number of Patients:15/23 patients were SPT tested with purified rye and barley proteins (Palosuo et al. 2001 ). 113 patients were SPT tested with rye. 145/360 patients from 3 months to 30 years, median 4.5 years gave a positive SPT to a cereal (Jones et al. 1995 ). 2/6 children gave positive SPT with rye, who were all positive on open challenge (Järvinen et al 2003 ). Out of 23 patients, 15 gave positive reactions with 10/15 patients reacting to gamma-70 secalin and 3/15 patients reacting to gamma-35 secalin. (Palosuo et al. 2001 ). The reaction was always weaker than with wheat omega-5 gliadin. 46/113 patients were SPT positive with rye (Jones et al. 1995 ). 20/35 patients reacted to rye pollen (Varjonen et al. 1994 ). Purified secalins (Palosuo et al. 2001 ). Rye flour extracted with 50mM sodium acetate buffer pH 3.8, 0.3% phenol or with 10 mM potassium phosphate, pH 7.0, with 400 mM NaCl and 0.3% phenol (Varjonen et al. 1994 ). ELISA (Palosuo et al. 2001 ). RAST Varjonen et al. (1994) . 23 patients with exercise induced anaphylaxis (Palosuo et al. 2001 ) with 5 new and 18 included from Palosuo et al. (1999) ). 5 of the 18 were included in Varjonen et al. (1997) . Jones et al. (1995) ) studied sera from 15/145 patients of whom 9/15 were challenge positive to a cereal. 39/40 adults with 35 with atopic dermatitis, 1 rhinitis and 4 urticaria (Varjonen et al., 1994 ). Rye specific RAST was observed for 39 patients, five had class 4, ten class 3, fourteen class 2 and five class 1 RAST results. Five had class zero but were positive in immunoblotting to rye proteins. 35 patients gave IgE-positive immunoblots with rye proteins. Jones et al. (1995)  used 1D SDS-PAGE with a 3% stacking gel and 13.5% separating with samples reduced with dithiothreitol. Varjonen et al. (1994)  used 1D 5-17% SDS-PAGE under non-reducing conditions. Palosuo et al (2001)  detected IgE binding to purified proteins by ELISA or ELISA inhibition. Jones et al. (1995)  used nitrocellulose membranes and washed with Tween containing solutions. Varjonen et al. (1994)  electrotransferred proteins onto 0.2µm nitrocellulose membranes which were cut into strips and incubated overnight with sera (1:4 dilution) in saline with 0.5% Tween. Detection used 125I labelled anti-human IgE. Palosuo et al (2001)  report that 21/23 (91%) of patients with wheat-dependent, exercise-induced anaphylaxis showed IgE antibodies to gamma-70 secalin and 19/23 (83%) to gamma-35 secalin. Jones et al. (1995)  report that immunoblotting showed extensive cross-reactivity between wheat, rye, barley and oats, which was not always clinically relevant. Varjonen et al. (1994)  report that the most frequent bands recognised were 40 kDa, (16/35) and 26 kDa (14/35). Other proteins were detected as intermediate allergens (10%-50%), running at 7 kDa, 8 kDa, 20 kDa, 24 kDa, 28 kDa, 30 kDa, 40 kDa, 46 kDa, 69 kDa, 79 kDa and 84 kDa. Food used and oral provocation vehicle:After an initial drop tested on the lips, oral doses were 1, 5, and 10g of cereal given at 0.5h intervals on day 1 followed by normal eating of cereal on day 2 (Järvinen et al. 2003 ). 10% cereal cooked in water. Oral doses were 1, 2, 5, 10, 20, 50, 100mls given at 1h intervals. Blind challenges were concealed in buckwheat (Rasenen et al. 1994 ). Open (Järvinen et al 2003 ). DBPCFC with negative checked by open challenge (Jones et al. 1995 ). Open or single blind (Rasenen et al. 1994 ). 7 patients were challenged with rye (Järvinen et al. 2003 ). 7 patients were challenged with rye (Jones et al. 1995 ). 6 patients gave a positive response to rye. One immediate with urticaria and five delayed with 2 eczematous rash, 2 diarrhoea and 1 rash and diarrhoea (Järvinen et al. 2003 ). Reactions that occurred within an hour from the last dose were defined as immediate. 5/7 patients gave a positive challenge with rye (Jones et al. 1995 ). 2/3 children with atopic dermatitis gave an immediate reaction to rye (one gave delayed reactions) (Rasenen et al, 1994 ). Reactions that occurred within 2 hours from the last dose were defined as immediate. Barley, wheat and rye are closely related cereals, all being members of the Triticeae, and have seed stirage prolamins as the major seed protein constituent. Oats are more distantly related and contain a lower proportion of storage prolamins which are structurally distinct from those of the Triticeae. Palosuo et al. (2001)  showed that gamma-70 and gamma-35 secalins in rye and gamma-3 hordein in barley are IgE cross-reactive with omega-5 gliadin, a major allergen in wheat-dependent, exercise-induced anaphylaxis. These are homologous proteins. Patients with wheat allergy alone showed extensive in vitro cross-reactivity to other grains, barley, rye and oats, but little to taxonomically related grass pollens, whereas patients with grass pollen allergy alone showed extensive in vitro cross-reactivity to both cereal grains and grasses (Jones et al. 1995 ). Atopic dermatitis, AD, has been associated with cereals and many of the studies of cereal allergy have used patients with AD. However, the role of food allergy in AD has been controversial (see the entry on wheat ) as is the nature of the allergic reaction as positive challenges to cereals are often delayed rather than immediate. Coeliac (celiac) disease is outside the scope of this database but is an important hypersensity to rye. It is a T-cell mediated reaction to cereal gliadins (Shan et al. 2002 ) and is distinct from IgE mediated type I hypersensity in both clinical symptoms and in mechanism (Green and Jabri, 2003 ). Dermatitis herpetiformis may be a related dysfunction of the immune system. Rye is also reactive in baker's asthma. Jones SM, Magnolfi CF, Cooke SK, Sampson HA. Immunologic cross-reactivity among cereal grains and grasses in children with food hypersensitivity. Järvinen, K.-M., Turpeinen, M. & Suomalainen, H.
Concurrent cereal allergy in children with cow's milk allergy manifested with atopic dermatitis. Palosuo K, Alenius H, Varjonen E, Kalkkinen N, Reunala T.
Rye gamma-70 and gamma-35 secalins and barley gamma-3 hordein cross-react with omega-5 gliadin, a major allergen in wheat dependent, exercise-induced anaphylaxis. Varjonen E, Savolainen J, Mattila L, Kalimo K.
IgE-binding components of wheat, rye, barley and oats recognized by immunoblotting with sera from adult atopic dermatitis patients. A novel wheat gliadin as a cause of exercise-induced anaphylaxis. Varjonen E, Vaino E, Kalimo K.
Life threatening, recurrent analphylaxis caused by allergy to gliadin and exercise. Rasanen L, Lehto M, Turjanmaa K, Savolainen J, Reunala T.
Allergy to ingested cereals in atopic children. Shan L, Molberg O, Parrot I, Hausch F, Filiz F, Gray GM, Sollid LM, Khosla C.
Structural basis for gluten intolerance in celiac sprue. Process, chemical, enzymatic:Allergenicity survives cooking. The stability cereal allergens from wheat, rye, barley and oat was studied by Varjonen et al. (1996)  who found that no processing condition entirely abolished IgE binding. Nature of main cross-reacting proteins:The wheat omega-5 gliadins, rye gamma-70 and gamma-35 secalins, and barley gamma-3 hordein are homologous and show IgE cross-reactivity (Palosuo et al. 2001 ). Allergen properties & biological function:Seed storage proteins (Shewry et al. 1999 ). The 35K secalins are related to wheat gamma-gliadins and are also monomeric. Whole grains were ground and extracted with 0.05 mmol/L PBS with 0.15 mmol/L NaCl for 2 h at room temperature and overnight at + 4° C. The extract was centrifuged (30 000 X g for 20 min). The precipitate was extracted with 75% ethanol at room temperature overnight, centrifuged (30 000 X g for 20 min), and the supernatant was collected and filtered. It was evaporated in a vacuum centrifuge and dissolved again in 20% acetonitrile (ACN) containing 0.1% trifluoroacetic acid (TFA). Gel filtration was performed on a Superdex 75 HighLoad 16/60 column (Pharmacia Biotech, Uppsala, Sweden) at a flow rate of 0.5 mL/min in 20% ACN-0.1% TFA for the ethanol-soluble extracts. The fractions showing positive bands in immunoblotting with antibodies raised in rabbits to omega-5 gliadin were further purified by reversed-phase chromatography on a Resource RPC 3 mL column (Pharmacia Biotech) using a linear gradient of ACN (20-60% in 60 min) in 0.1% TFA (Palosuo et al. 2001 ). The sequences http://ca.expasy.org/cgi-bin/niceprot.pl?Q9S8A7 and http://ca.expasy.org/cgi-bin/niceprot.pl?Q9S8A8 are N-terminal 29 and 20 residues peptides (Rocher et al. 1996) . The prolamins of the Triticeae. Varjonen E, Bjorksten F, Savolainen J.
Rocher A, Calero M, Soriano F, Mendez E.
Identification of major rye secalins as coeliac immunoreactive proteins. Protein Family:Secalins part of the prolamin family of seed storage proteins. Process, chemical, enzymatic:The stability of cereal allergens from wheat, rye, barley and oat was studied by Varjonen et al. (1996)  who found that no processing condition entirely abolished IgE binding. Nature of main cross-reacting proteins:The rye-sensitive patients were initially screened for wheat-DEIA and cross-reactivity with other cereals identified (Palosuo et al., 2001 ). Antibodies were raised in rabbits to omega-5 gliadin and cross-reactivity with other cereals studied, the proteins purified and used in SPT. In a group of oat-allergic individuals 35 patients also gave IgE-positive immunoblots with rye proteins (Varjonen et al., 1994 ). Most frequent bands recognised were 40 kDa, (16/35) and 26 kDa (14/35). A range of other proteins were detected at 7 kDa, 8 kDa, 20 kDa, 24 kDa, 28 kDa, 30 kDa, 40 kDa, 46 kDa, 69 kDa, 79 kDa and 84 kDa. Allergen properties & biological function:Seed storage proteins (Shewry et al. 1999 ). 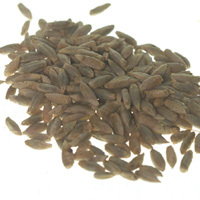 The 70 kDa secalins are related to wheat gamma-gliadins. They differ in that the 7S gamma-secalins have more extensive repetitive sequences and form polymers by inter-chain S-S bonds. The N-terminal peptides are both 23 residues (Rocher et al. 1996) . Enzyme inhibitors of seeds:types and properties.